At the beginning of the 1976/77 season Jock Stein was on the look out for a striker who could not only score goals but beef up a lightweight Celtic attack. 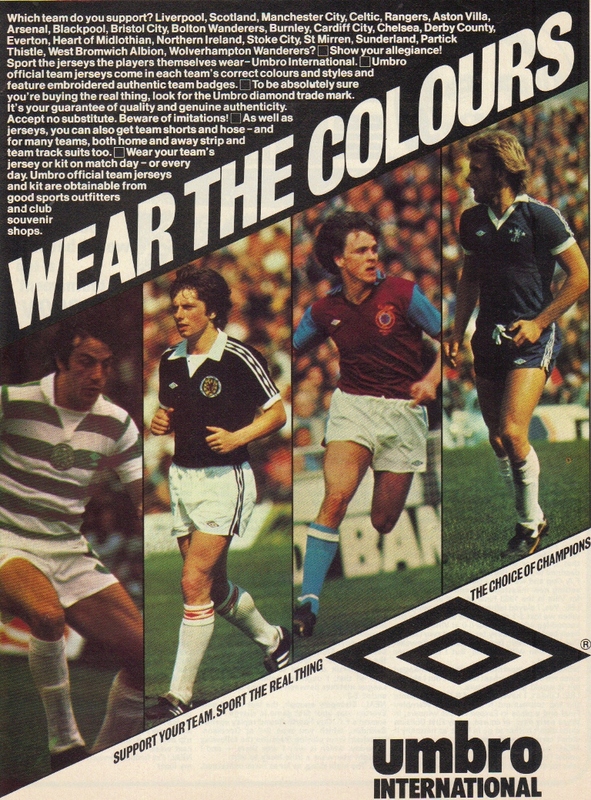 Newspapers had linked us with Ian Wallace of Dumbarton (who went to Coventry), Mark McGhee of Morton (who went to Newcastle) and John Duncan of Tottenham. 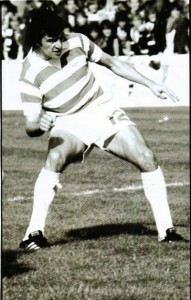 In September Stein eventually opted for Joe Craig who came from Partick Thistle for a then considerable fee of £60,000. Craig was a Scotland under 23 international with a good pedigree and he was to be a welcome acquisition for that season. 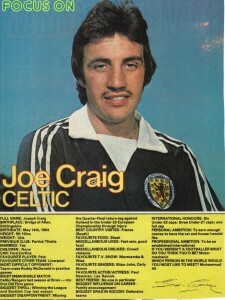 Joe Craig was only to spend two years at Parkhead but he was to cram a lot into it. 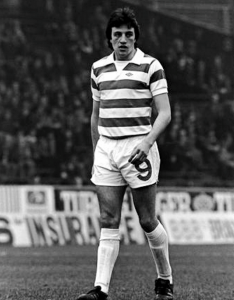 He immediately settled into the number nine shorts and developed a fine understanding with Ronnie Glavin which the two of them had originally developed at Firhill. Between them both they were to score 51 goals that season. Joe settled in well and in November 1976 he was to make his mark as a Celt. On November 20th Celtic found themselves in great difficulty by being 3-1 down at half time at Tynecastle. In a recent interview Joe recalled that the Celtic fans had burst into song at the start of the second half as they sang ‘We Are Sailing’, the famous Rod Stewart song of that time. 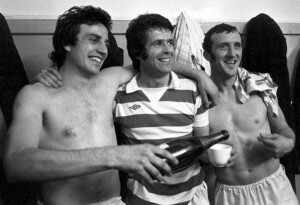 This greatly motivated the Celtic players who went on to grab a dramatic 4-3 win and although Joe didn’t score he had played his part in the victory. Four days later Celtic travelled to Ibrox for an unusual midweek fixture and it is this game that Joe is most fondly remembered for. He scored the only goal of the game, a marvellous swivelling shot on the turn from outside the area which fairly flew into the top corner, easily one of the most memorable goals a Celtic player ever scored at Ibrox. 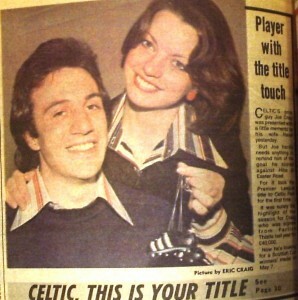 This victory settled Celtic for the remainder of the season. As the season wore on Joe improved even more. He scored four against Airdrie in the Scottish Cup and when Celtic reached the semi final it was Joe’s two headers that defeated Dundee at Hampden. On April 16th 1977 he scored his most important goal in the hoops when he notched the only goal in Celtic’s 1-0 win at Easter Road that gave us our first ever Premier League title, a volley after a Glavin shot came off the post. It’s a goal all but forgotten in Celtic’s modern history as Hibs’ chairman Tom Hart had banned the TV cameras from the ground in a personal crusade against the perceived damage that television coverage was doing to the game. Odd that old Tom should wait until three weeks before the end of the season before starting his campaign but that’s a story for another day. 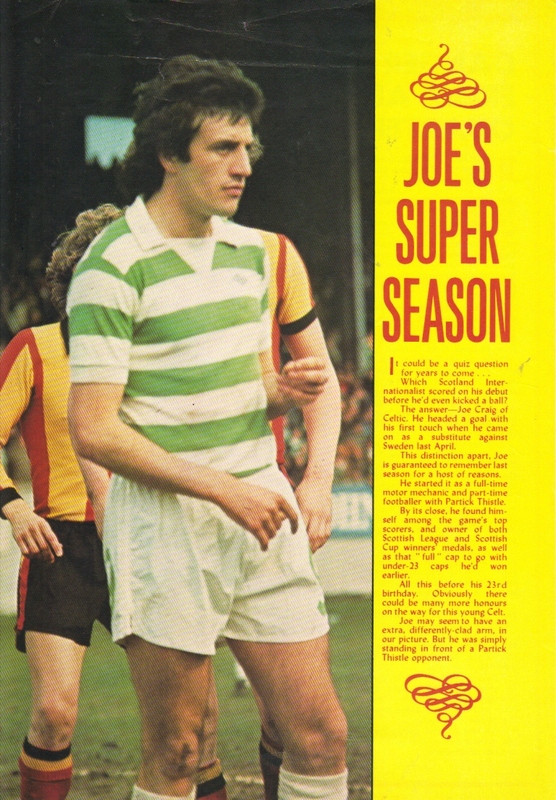 Joe completed his medal double on May 7th when Celtic beat Rangers 1-0 in the Scottish Cup final but he had an off day as he missed two sitters in the second half when put clear on goal and Celtic had to survive a late onslaught before lifting the cup. 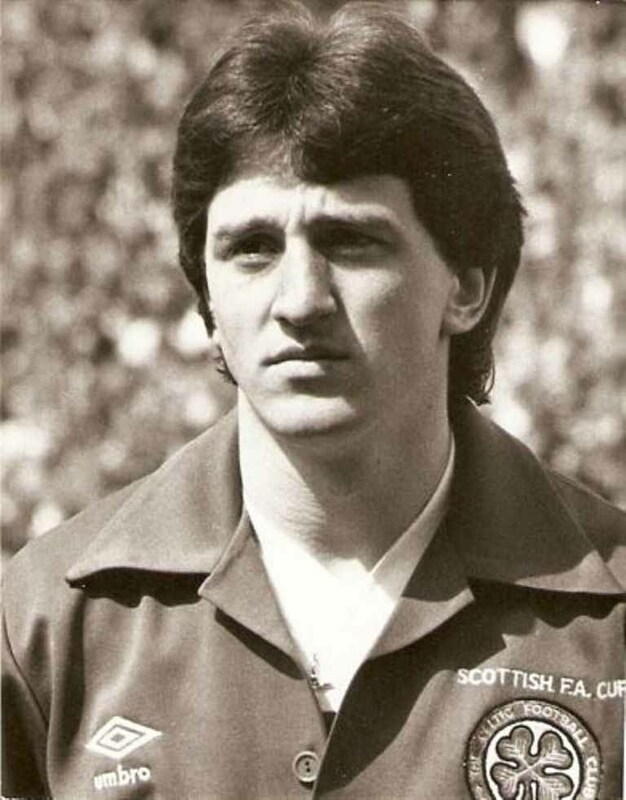 Shortly before that Craig had made his debut for Scotland against Sweden at Hampden. He replaced Kenny Burns and scored with his first touch, a header from a Sandy Jardine cross. And thus comes the famous quiz question – Who scored for Scotland before he had kicked a ball ? 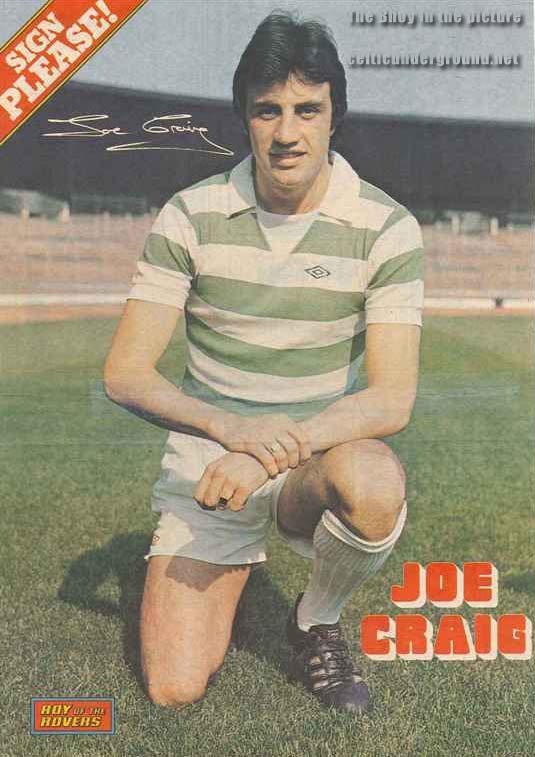 Answer – Joe Craig. This was to be his only appearance for Scotland. After the excitement of that first season it was all downhill for Joe. Dalglish, Celtic’s great inspiration of the period, moved on to Liverpool and although Craig and Glavin took up their usual positions the final ball did not arrive any more. 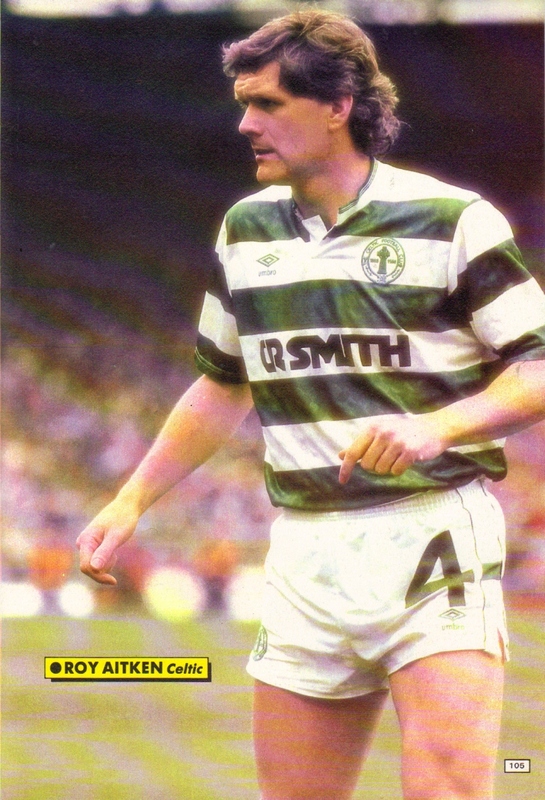 He did score in the European cup games against Jeunesse Esch and Innsbruck but injuries also took their toll. In the summer of 1978 Billy McNeill took over as manager and it became clear that Joe was not in his plans, the new manager preferring McAdam, McCluskey and Conn up front. Still, Joe was to play a small cameo before departing. 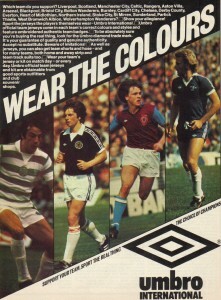 On September 9th 1978 Celtic were 2-1 up against Rangers at Parkhead and hanging on when Craig appeared as a sub. With minutes left he ran at the Rangers defence and Tom Forsyth tried an unorthodox rugby-style tackle but Joe wriggled clear and set up Tom McAdam for Celtic’s clincher. A matter of days later and he had been transferred to Blackburn Rovers for £50,000. It was good to see Joe back in the spotlight recently when he was pictured advertising the new Celtic book, ‘The Supersonic 70’s’. He may only have played a small role in Celtic’s history but Joe is fondly remembered by those of us who recall that ‘supersonic’ period.